Chris Coombs travelled all the way from Melbourne, Australia to attend AWS re:Invent 2017. He was delighted to be one of the lucky few to get his hands on AWS DeepLens. He put it to good use by entering the AWS DeepLens Challenge Hackathon. A man of many talents, he is a husband and father of two little ones, and he’s an ex-lawyer turned software engineer/cloud architect. For the AWS DeepLens Challenge Hackathon he created the project called ASLens. 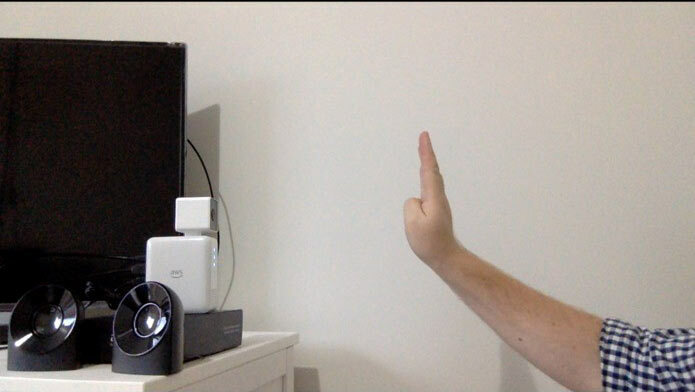 ASLens uses AWS DeepLens to capture video of a person signing in American Sign Language (ASL). Then it runs a deep learning model (built with Amazon SageMaker) against each frame. When a letter from the ASL alphabet is recognised, AWS DeepLens plays the audio of that letter (using an MP3 file generated using Amazon Polly). ASLens runs locally on the AWS DeepLens, so an internet connection is not required, eliminating bandwidth issues and increasing speed. Chris is familiar with AWS: He’s a co-organizer of the AWS Melbourne User Group, and he works for Datacom as their AWS APN Cloud Warrior. He was keen to further build his skills by getting hands-on with machine learning using AWS DeepLens. He built ASLens leveraging a range of AWS services including Amazon SageMaker, AWS Lambda, Amazon Polly, and, of course, AWS DeepLens. We interviewed Chris to learn more about his experience with AWS DeepLens, and we asked him to tell us a bit more about how he created ASLens. As a fan of Silicon Valley and of Australian “sausage sizzle” he had a lot of fun at the workshop and back home in Australia putting the “Hot Dog Not Hot Dog” model to the test! You can read more about how Chris built ASLens and access the GitHub repo on the ASLens community project page. Congratulations to Chris and his family on creating this great project! Hopefully, Chris’s story has inspired you to want to learn more about AWS DeepLens. You can view all of the projects from the AWS DeepLens Challenge on the DeepLens Community Projects webpage. For more general information, take a look at the AWS DeepLens website or browse AWS DeepLens posts on the AWS Machine Learning blog. The AWS DeepLens Challenge was a virtual hackathon brought to you by AWS and Intel to encourage developers to get creative with their AWS DeepLens. To learn more about the contest, check out the AWS DeepLens Challenge website. Entries are now closed.